In the early 1950s, Arthur Graham and Margaret Branch Glasgow named the Medical College of Virginia in their estate plan. Their wishes were to advance efforts to cure and prevent cancer and other degenerative diseases. They died soon thereafter. Sixty years later, after the death of their last heir, the couple made possible the largest cash gift in the history of Virginia Commonwealth University. "For Richmond, and our entire community, it's amazing to think of the foresight that the Glasgows had more than 60 years ago," said VCU President Michael Rao, Ph.D., at a special ceremony held in August at the Virginia Museum of Fine Arts. The museum and 13 other local groups also were beneficiaries. "The impact of their generosity enhances the quality of lives, our culture, our health and our service to the community in so many different ways," Rao added. "Their gift will be used in the same forward-thinking, generous and compassionate spirit in which it was given to support the cure and prevention of cancer and other degenerative diseases." Sixty years after their deaths, the couple's planned gifts totaled $125 million. Nearly $70 million ? another record cash gift ? 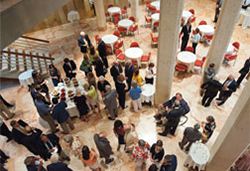 went to VMFA to strengthen its vast collections, $45 million was dedicated to VCU's cancer research and prevention programs and the remaining $10 million was distributed to 13 nonprofit organizations in Richmond and elsewhere. The impact of the VCU gift is far-reaching. "The Glasgows' gift is the kind of gift that elevates a university like ours even further," Rao said. "As a major research university, a gift of this magnitude enables us to support the people, the facilities and the programs necessary to make a difference in peoples' lives and certainly in the health of our community."